TO reduce the burden of the state exchequer by Rs 600 crore, Bihar has decided to reduce its minimum wage rate offered to unskilled labourers, and make it on a par with the rate offered under the Mahatma Gandhi National Rural Employment Guarantee Act (MGNREGA). This is despite the Supreme Court’s ruling, in many cases, that any wage less than the state wage rate is tantamount to forced labour. But the state says it has no choice. “A poor state like Bihar would be unable to bear increased wages,” says Amrit Lal Meena, secretary of state rural department. The wage reduction came to light following an RTI application by Ashish Jha of Bihar’s Jan Jagran Shakti Sanghthan, a trade union. The documents accessed through RTI show the state rural development department has completed almost all formalities to reduce Bihar’s minimum wage from Rs 157 to MGNREGA wage of Rs 122 for 2012-13. At present, the state is maintaining last year’s minimum wage of Rs 144, citing lack of funds. In 2011-12, the MGNREGA wage for Bihar was Rs 120, which was increased by Rs 2 the next year. Every state labour department annually revises its wage rate under the Minimum Wages Act after adjusting inflation, while the Union rural development ministry annually fixes a countrywide wage rate under MGNREGA based on consumer price index for agricultural labourers. In 2009, workers’ unions, including Karnataka Prantha Raitha Sangha and Bhartiya Mazdoor Sangh, filed a petition in the Karnataka High Court against the wage rate under MGNREGA. The petitioners termed the wage rate “unconstitutional” as it was lower than the state’s minimum wage rate. 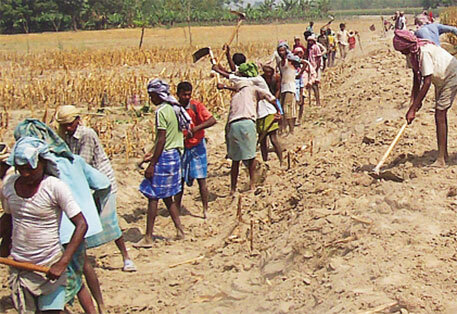 In September 2011, the court ruled in the unions’ favour and directed the Central government to bring MGNREGA wages on a par with the states’ minimum wages. Three months later, the Union government challenged the High Court order in the Supreme Court. In January 2012, the Supreme Court Bench declined to put a stay on the High Court judgement and suggested that the Centre decide the issue through consultation. The case is pending. According to Bihar rural development minister Nitish Mishra, the increment of Rs 2 by the Centre was a farce. “We institute minimum wage which at least respects unskilled labourers’ dignity.” When asked about the state’s decision to reduce the minimum wage, he said, “We are maintaining status quo by continuing last year’s minimum wage of Rs 144. We are also awaiting the Supreme Court’s judgement on payment of minimum wage under MGNREGA before lowering the state wage rate.” Mishra is referring to a 2009 petition filed in the Karnataka High Court. In the case the court had ruled that the MGNREGA wage cannot be less than the minimum rate fixed by the state. The ruling was challenged by the Centre in the apex court (see ‘The Karnataka case’). In April 2012, the state rural development department expressed apprehension about the state’s limited resources. It said the state would be unable to manage the ever-increasing gap between the state wage and the MGNREGA wage rates. The department urged the state chief secretary for intervention, following which the law department was approached. S D Sanjay, additional advocate general, said the state cannot make any budgetary provision under any wage payment-related provision under MGNREGA. “The Centre is responsible for paying deficits arising due to difference in the two wages,” he said. He termed section 6(1) of MGNREGA as unconstitutional. This section states that the Centre can decide the wage rate offered under MGNREGA without referring the states’ Minimum Wages Act. Fearing unnecessary litigation, the government asked the law department to reconsider its opinion. Strangely, another additional advocate general contradicted the earlier views. He said it would be illegal to pay lower than the wage prescribed under the Minimum Wages Act and the state cannot claim compensation to fill gap between the wages. Citing differences in opinion, the state government decided to bring down the minimum wage rate to that offered under MGNREGA. “Instead of moving a step forward, the Bihar government is taking a step backward,” says Jha. The affairs of the State are managed by criminals - thugs in the garb of saints! This is shame on the part of Bihar govt trying to reduce minimum wages; contrary to it, they should raise the minimum wage. The so called recovery took place in Bihar due to retaining its labour and people finding to do some work other than migrating to far away places. This is not the way the chief Minister to demonstrate leadership by cutting the wages from the Labour. Hope he and his advisors reflect on this issue and show some leadership and courage by increasing the NREGA wages on par with the markets.